2. Must have completed a compulsory rotatory internship. 1. Diploma / MD Public health /PSM/ Community Medical / CHA/Tuberculosis & Chest Diseases. 3. Basic knowledge of computers. 2. recognized sanitary inspector’s course. 3. Certificate course in computer operation. 1. Tuberculosis health visitor’s recognized course. 3. Successful completion of the basic training course (Govt. recognized) for Multi- purpose health workers. 1. Intermediate (10+2) and Diploma or certified course in Medical Laboratory Technology or equivalent. 2. Candidates with Higher qualification (for example graduates) shall be preferred. 3. Tuberculosis health visitor’s recognised course. Certificate course in computer operations. 1. Training Course for MPW or recognised sanitary inspector’s course. 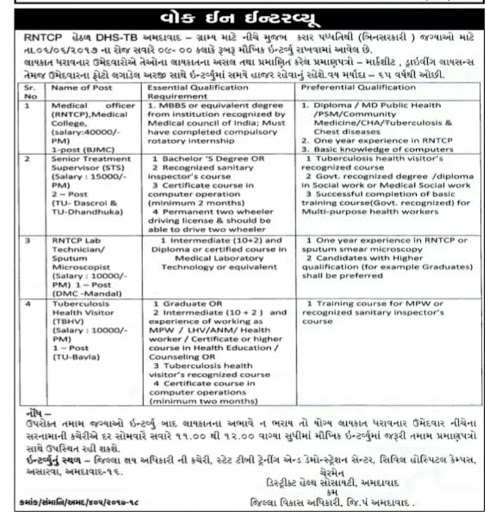 Venue: Office of District TB Officer, State TB Training &amp; Demonstration Center, Civil Hospital Campus, Aswara, Ahmedabad – 380016.